Moments with the Mays: Griffin is 15 months old! 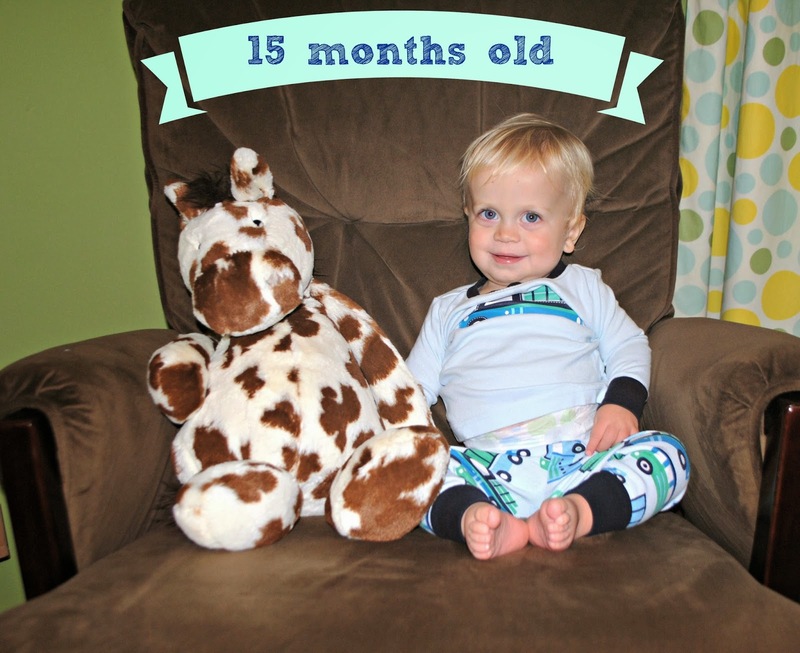 Griffin, you are 15 months old! That seems like more of a toddler & less like a baby...thankfully, you still have some baby left in you! Weight: I'm hoping you are finally at 20lbs! We find out at the doctor soon. Clothing: all 12 month & even some of those are too big! You can't really wear pants because your waist is too tiny & they all fall down! You are cutting some more teeth. When they officially make their way down, I believe you will have 16 teeth! You no longer let us rock you to sleep...this makes me sad. Well, you let us rock you to sleep but then you get MAD when we lay you down. So, we are now just reading, snuggling, & laying you down. I'll miss that sleeping baby in my arms! You are practically running now! It's more of a power walk but you've almost got the running thing down. You are so fast! You have also mastered your brother's perfect weed-eating sound effects. It is hysterical. You don't say much of anything but you can do yard work with the best of them! You aren't crying as much when we leave you at church. This makes my mama heart so happy. You love Ms. Tracy & she is usually your teacher. She's like the Griffin Whisperer. You had TWO Gator accidents this month. The Power Wheels Gator; not an actual alligator. (phew.) Grayson accidentally ran over your foot and you twisted your ankle. You were limping on it all night and we thought it was broken! I was thankful it was just a sprain. You also got run over by the Gator. You may be tiny, but you are tough. finding the toy cellphones, holding them up to your ear, & saying "HEY." milk! So glad to finally have a milk drinker! Griff, you such the opposite of your brother. It is so crazy to see! You are fearless, strong-willed, wild, and LOUD. You have such a fun personality. I love that the teachers at church look forward to seeing you on Wednesdays. They adore you & it makes me extra proud to be your mama. You are our tiny little peanut with a huge personality! We love you so much! So sweet!! He sounds so much like Reese! I call her my little girl with a big personality. She's super strong willed too & she still isn't a great sleeper! When did Griff's sleeping get better?